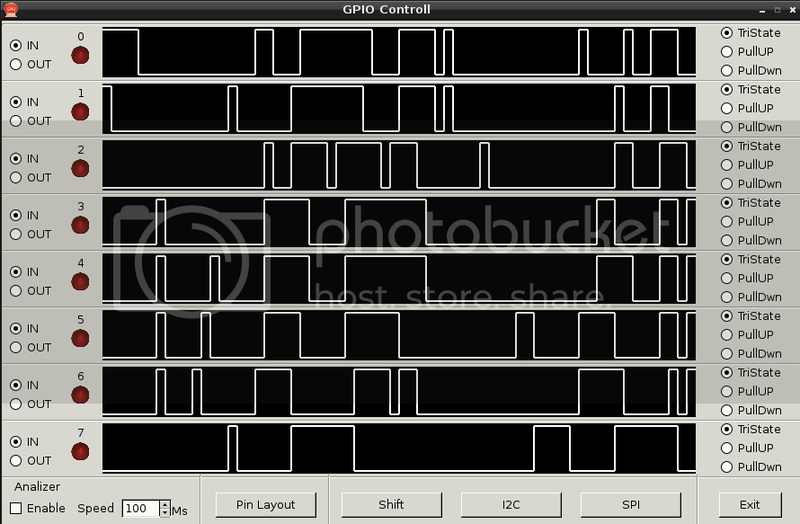 Wrote a GUI to control the GPIO (and I2C , SPI ) for testing. Click on Raw to download. Some improvements and bugs fixes. Looks like a logic analizer but its not really, timing is to unstable and a bit slow. Just giving some idea of whats going on on the bus. It does needs some testing if everything is working correct, I don t have an ISP device at the moment. Waiting for my USBee to arrive, then I can do some serious testing. Last edited by CWRoos on Tue Jul 23, 2013 1:56 pm, edited 1 time in total. Thank you. The screen shot is much more exciting and informative than the project announcement! I can see this could be a very useful program development or debugging aid. And as a side-effect it is an introduction to another GUI development tool for the RPi - I hadn't heard of Gambas before. DeeJay wrote: And as a side-effect it is an introduction to another GUI development tool for the RPi - I hadn't heard of Gambas before. Gambas actually was the first one I found and got working, even I'm actually a C++ programmer. Now there is a mono hardfloat, monoDevelop is working as well now but it makes mono executables. And of course there's lazarus, the pascal Delphi clone, and that one looks great, its some time ago I did pascal programming.. still if I had found it earlier I would have wrote this GPIOGUI in it..
well. Gambas is doing the job as well.. I get /usr/bin/env: gbr3: No such file or directory on soft float jessie and hard float raspbian (wheezy). I'm installing gambas3 on raspbian to see if that makes a difference. gambas3 is broken in soft float jessie. joan wrote: I get /usr/bin/env: gbr3: No such file or directory on soft float jessie and hard float raspbian (wheezy). That's why I made install packages in Gambas supposing that would work. Did some updates on the SPI. Actually the scripts are a bit to high level, was actually my intention to write a GUI for wiringpi and got a little out of control. The scripts should be low level with ACK and NAK, full adreses with read/write bit ect..
CWRoos wrote: Wrote a GUI to control the GPIO (and I2C , SPI ) for testing. In addition to RPi testing, the source/project is a good place to start for those wishing to build their own Gambas RPi application. This is seriously cool ... I do like a good GUI, it's my age. Wish I knew of it a month ago. first of all thank you for you wonderful work, i have some issues as i can not open the project code with gambas3.5.1 even after adding the missing project file, also when i run sudo ./GPIO.gambas it will get 100% cpu use indefinitely. also looking to have a small application project developed with gambas3 and see u familiar enough with i2c and graphics. please get back to me . I present to you my program. 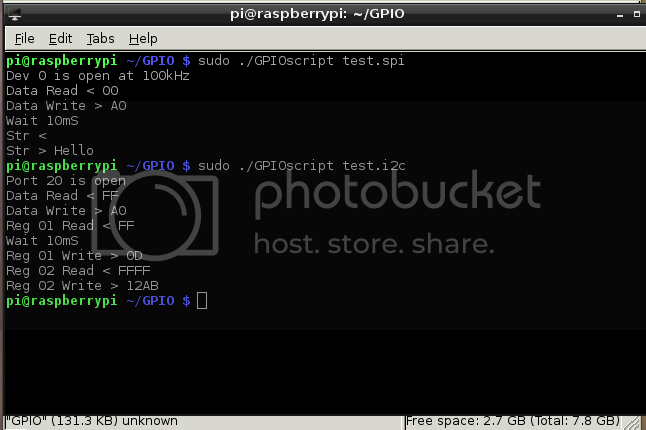 It can either display the status of GPIO, so they have to manage. Представляю вам свою программу. Она может показывать статус GPIO и управлять им.